This week has been much easier due to being hosted all week by Ali. I feel like I’ve had a break from the non-stop planning, unpacking and re-packing, finding accommodation, food, plug points and wifi. And on top of that I got to spend time with friends. 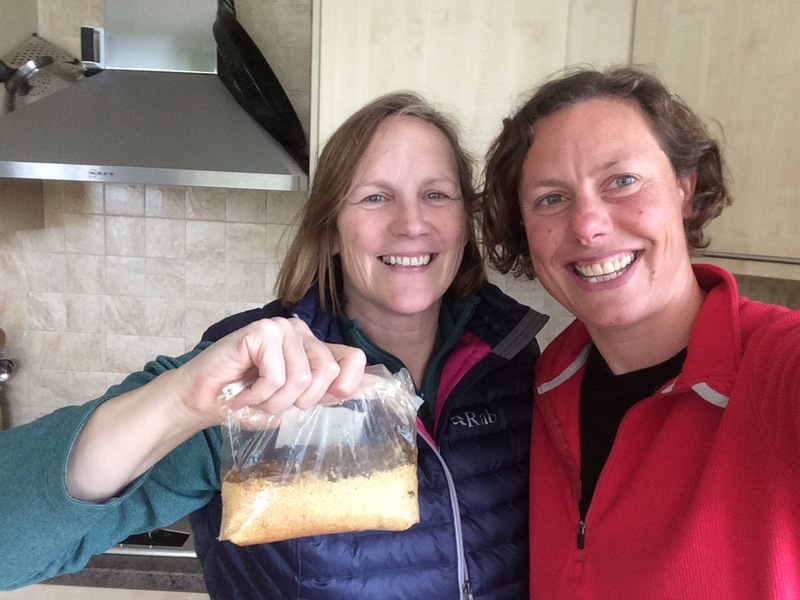 I also had meals cooked (although I did cook one and I also baked a cake), bike and small rucksack loaned to me, and a wealth of local knowledge passed on. I feel like I’ve got to know the Firth of Forth and Edinburgh a little bit this week and I’ve been lucky to have time to do a bit of sightseeing as well. I am convinced golf is the Scots’ national pastime. A big thank you to Ali for hosting me this week. It was time to pack my rucksack, say goodbye to Ali and set off on my long trip to the Shetland Islands. Next week is the first of my 2 planned ‘holidays within a holiday’ as I’m spending the week on Shetland. I really wanted to include the Shetland and Orkney Islands in my trip but can’t possibly walk around everywhere so I picked Shetland and am visiting for a week rather than walking round it. I’m hoping for more wildlife and rugged scenery. Heading as far North as possible in Britain is a great way to spend my 40th birthday, away from everyone and any possible parties. 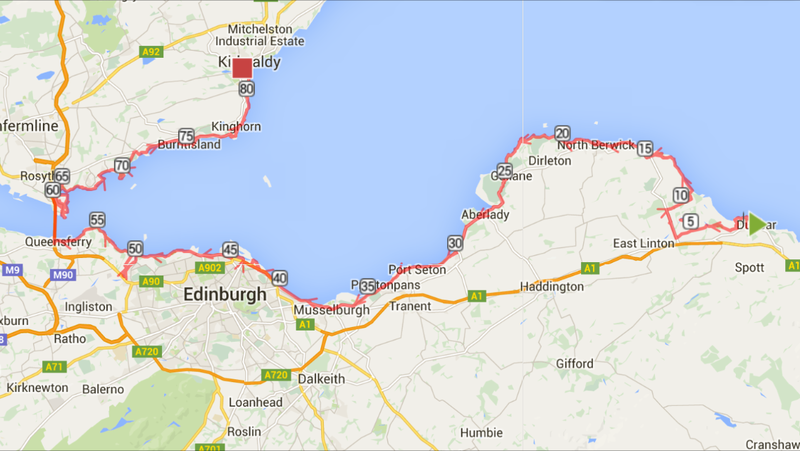 Back to walking on Monday 15th June when I will hopefully get back to Kirkcaldy. Really pleased that it’s such a windy day here in the North Sea; I hope I’m not seasick! I sat down last night and tried to work out the logistics of a commute to Kirkcaldy and then back from wherever I walked to. 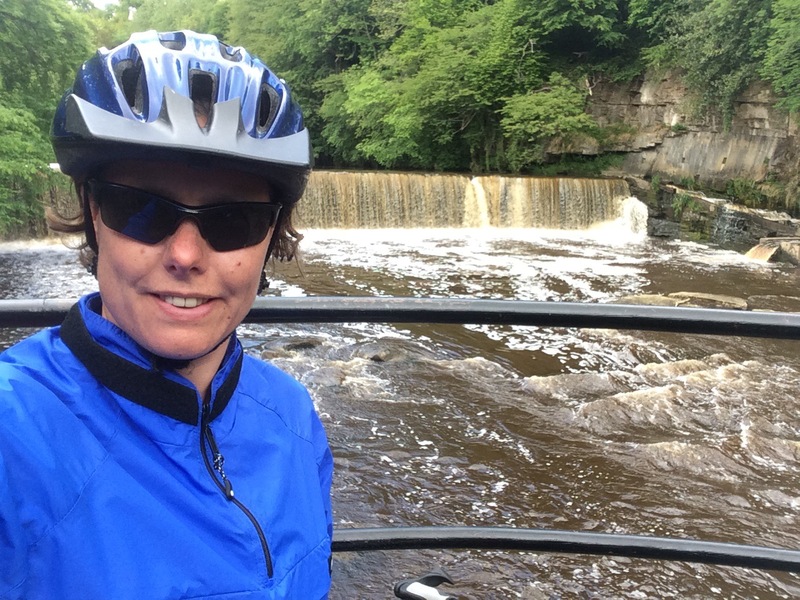 In the end I realised I the commuting would take longer than the walking so I decided I’d take a rest day, catch up with my blog and prepare for my trip to the Shetland Islands. It was nice to have an unexpected day off doing little. It was a slightly protracted commute today as I got the bus into Edinburgh centre and then the train out to Fife. I did enjoy the opportunity to go over the proper Forth Bridge this time. 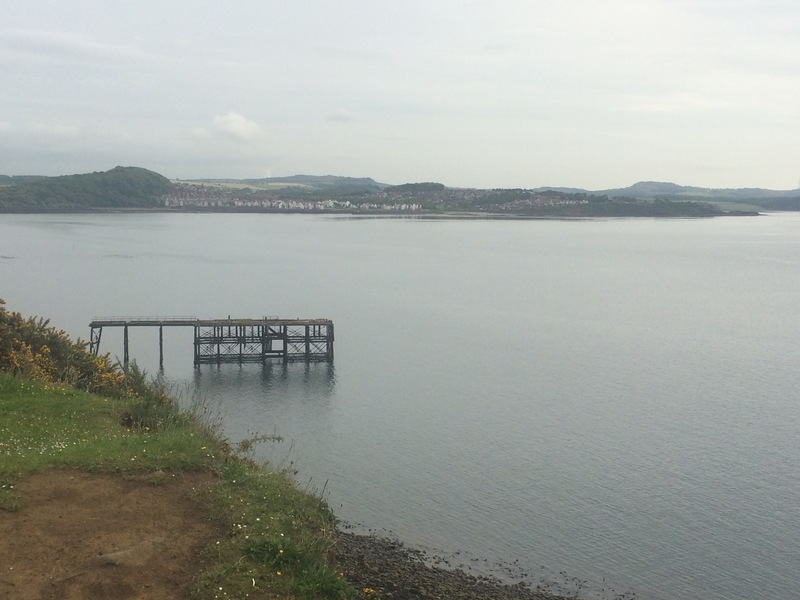 I got off the train at North Queensferry and immediately walked through Carlingnose Point wildlife reserve and past the whinstone quarry as I set off on the Fife Coast Path. It’s nice to walk on a way-marked coast path, although sometimes I am slightly perplexed when they veer away from the coast and I can find a more coastal route. This happened a couple of times today but it was all good fun. There was a wee bit of a haar today on the Forth (translation: a little bit of fog) so the views were a bit hazy and didn’t make for the best photos. I could still see loads though, all the islands and the Pentland Hills looming behind Edinburgh. 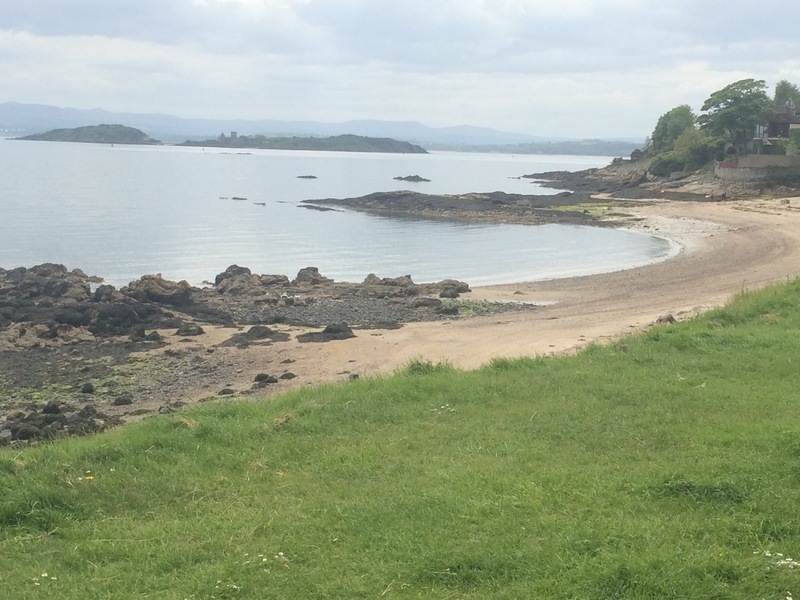 Dalgety Bay and Aberdour had some quite large houses overlooking the Forth and there was a nice pathway weaving along the shore almost until Braefoot Point. 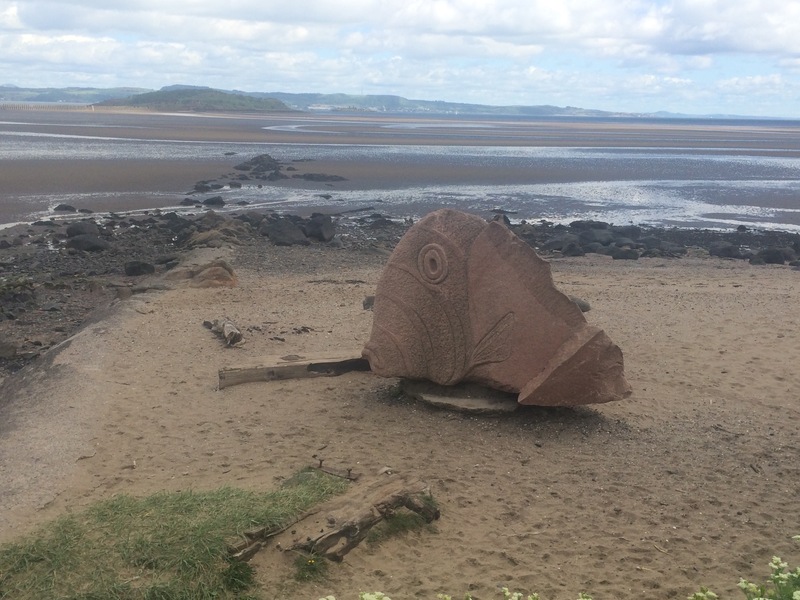 There were lots of signs around Dalgety Bay warning of high levels of radiation (no explanation) so don’t eat the shellfish! There wasn’t much wind today and, with the haar and the rocky shoreline, there was an eerie air about the place. Although it was raining for a couple of hours it was so light that I didn’t even need to put on a waterproof as I didn’t really get wet. Very strange. 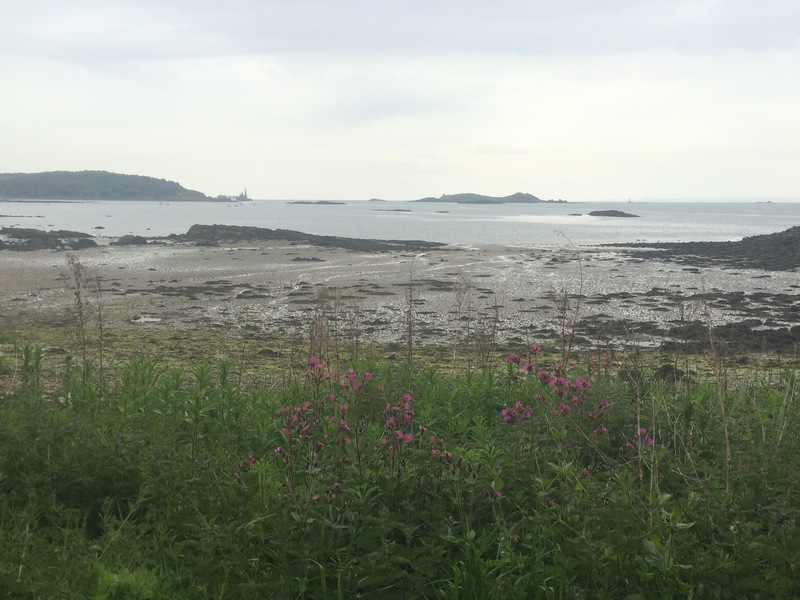 Walking from Dalgety Bay to Aberdour was one of those bits where the coast path went inland and I decided to walk along a different path that looked like it would get closer to the coast. I ended up walking through a beautiful wood, down a steep hill to Braefoot Point, along a rocky shore (saying hello to a couple of seals) and then scrambled back up a big hill to get around the Braefoot Bay Gas Terminal. 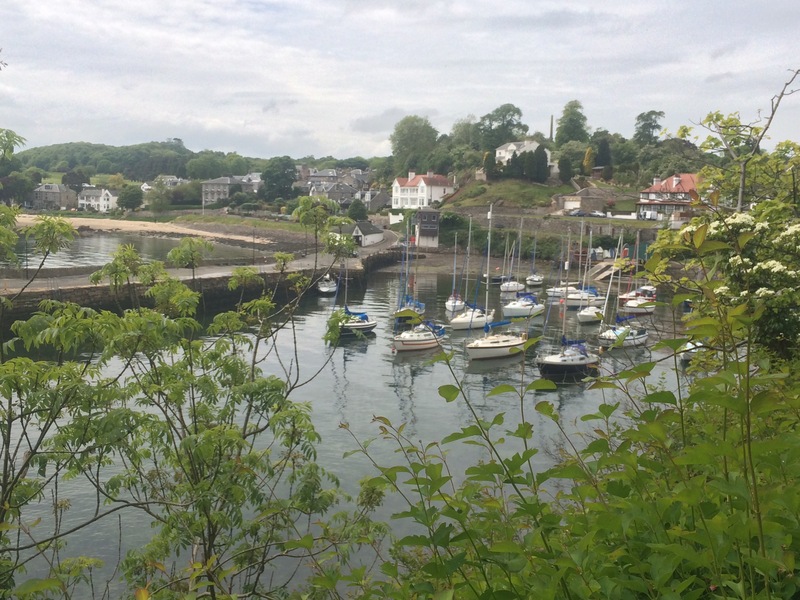 I stopped for a spot of lunch in Aberdour before pressing on to Burntisland, walking alongside the railway line. Burntisland seemed a bit more rundown and I had to do the walk to Kinghorn along the main road as the tide was in and so there was no beach. 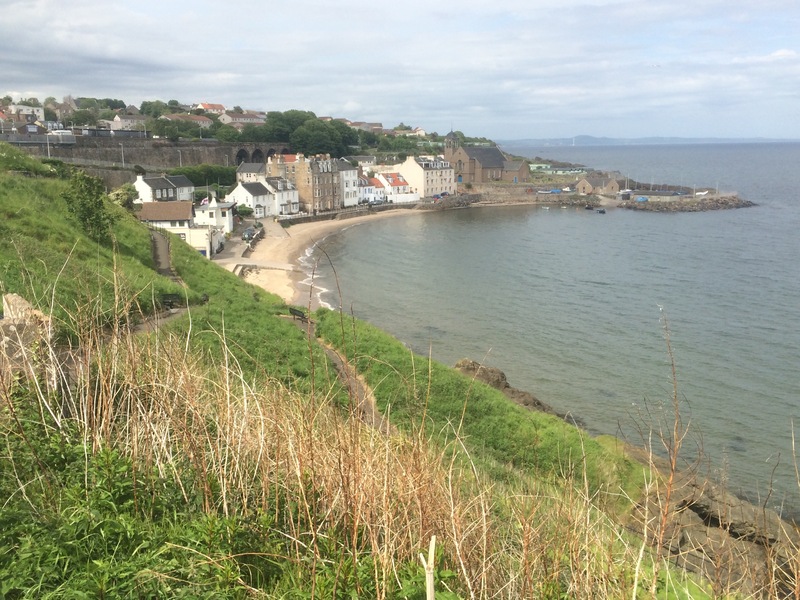 Kinghorn was very pretty, tumbling off a tall cliff. The last stretch was along a more rugged path sandwiched between the sea and the railway line. It was a chance to watch lots of Eider duck families and scan the Forth for Killer whales (some had been sighted near the Isle of May today but I didn’t see them unfortunately). Kirkcaldy is a large town and not the prettiest. Lots of rubbish on the beach and blowing against the barbed wire fences separating the empty shells of buildings from the beach. Shame. I headed into the town centre to the train station and the commute back to Dalkeith. 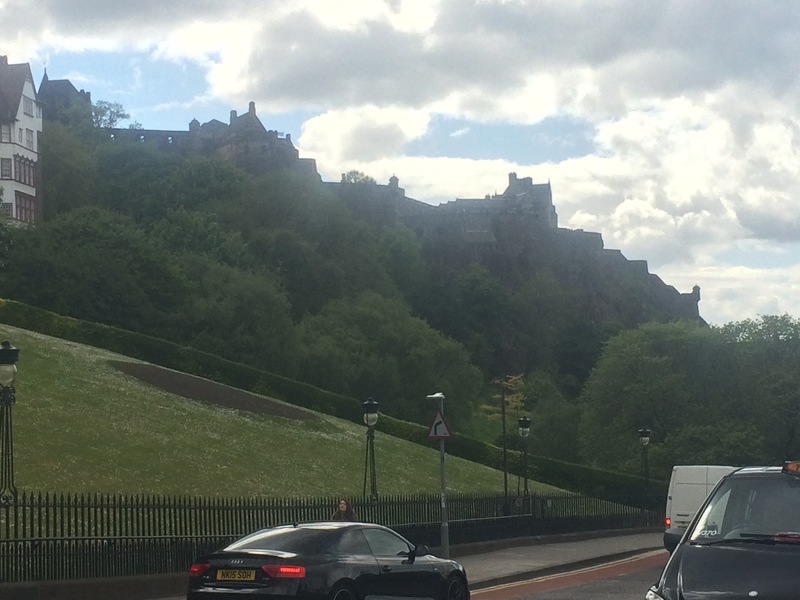 I have to admit I wasn’t overly excited about walking around the Edinburgh City coastline so when Ali suggested cycling instead I jumped at the chance. What a great idea. I would cover the same coastal route and could fit more in on a bike. 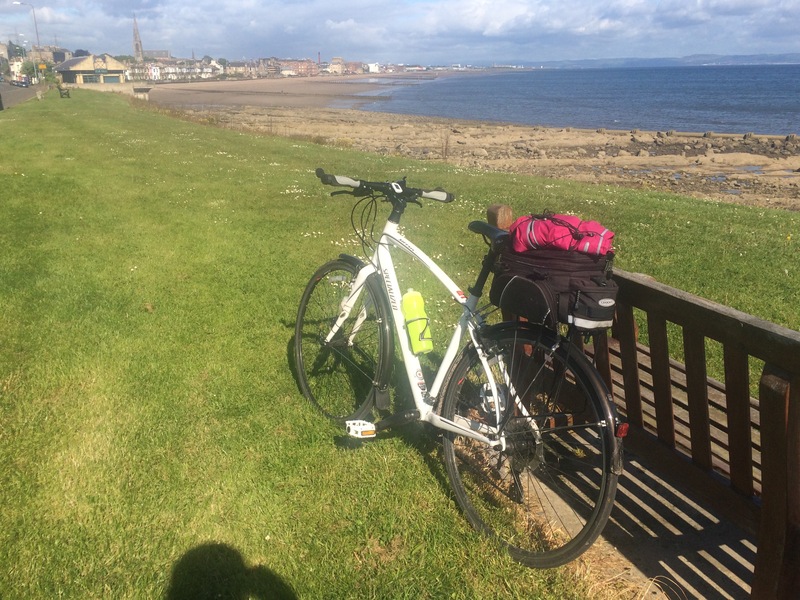 I set off through Dalkeith Country Park to the coast at Musselburgh. The first section was mostly on promenades through Joppa and Portobello; which seemed like quite an upmarket seaside town with some upmarket cafes. After that it’s around the corner, negotiating the Port of Leith. There is a sewage works and some industrial buildings to get around first and the walk/bike signs sent me down a dead end into Leith industrial estate so I was glad not to be walking. 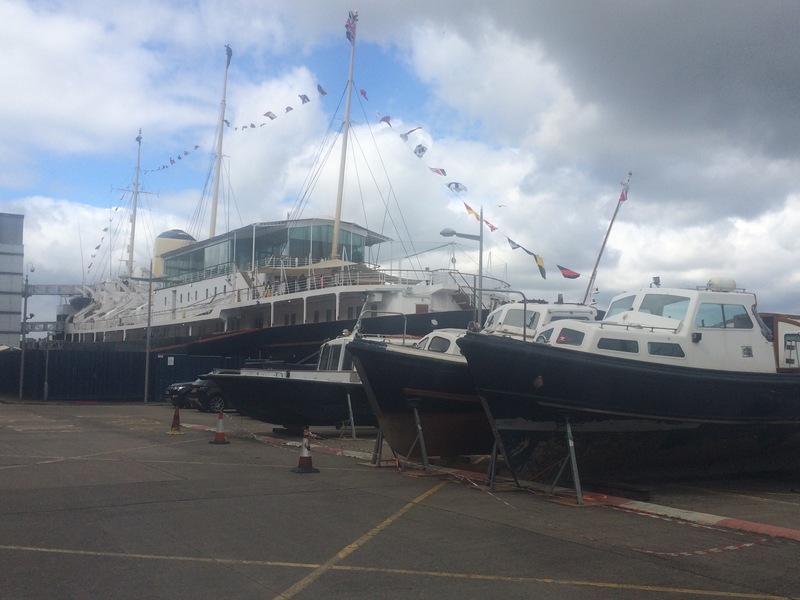 I popped around the back of the Ocean Terminal shopping centre to get a glimpse of the Royal Yacht Britannia that is permanently moored here and you can pay to visit. 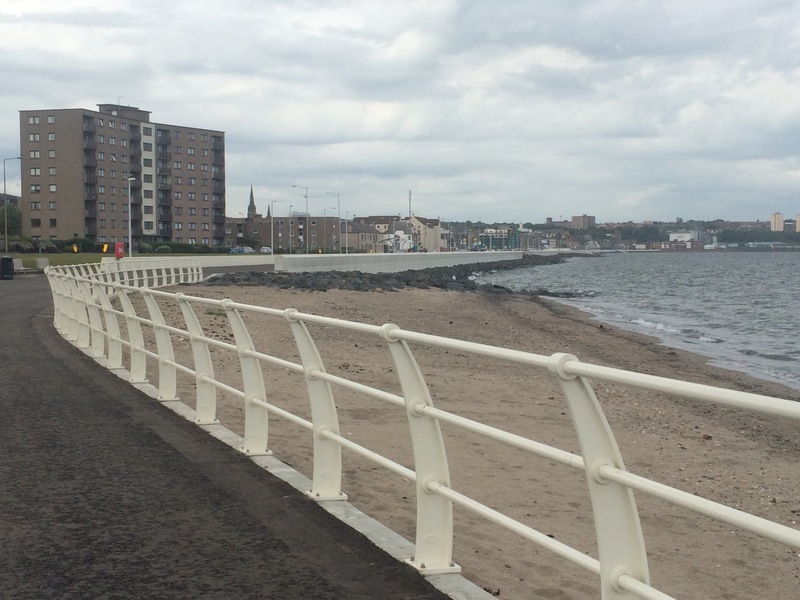 The route along the North coast of Edinburgh was quite dull until I reached Silverknowles and zipped along the promenade towards Crammond Island. The tide was coming in and, despite all the sand in the photo, I didn’t have time to cross to the island and back. From here I had to take a 1.5 mile detour inland in order to cross the River Almond. I followed a footpath and had to carry the bike up and down a few steps. Not too hard though. 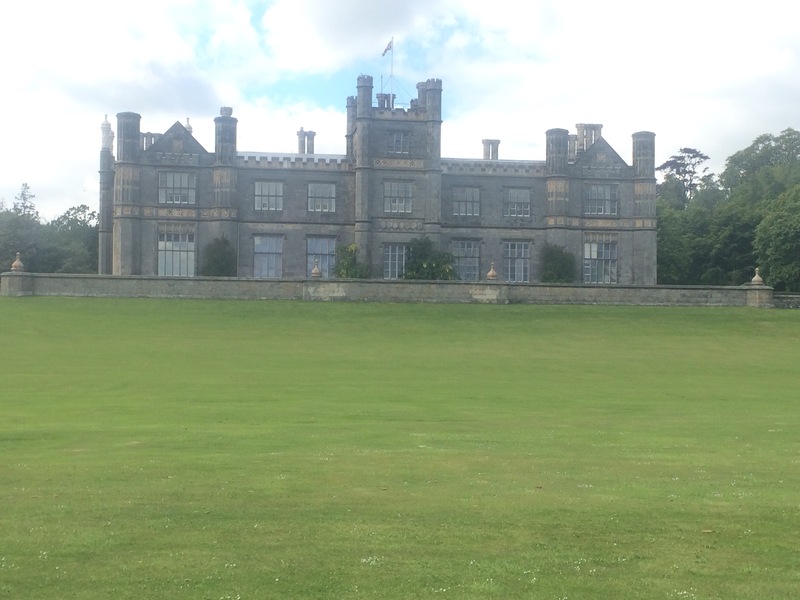 It was easy cycling through the park land surrounding Dalmeny House. 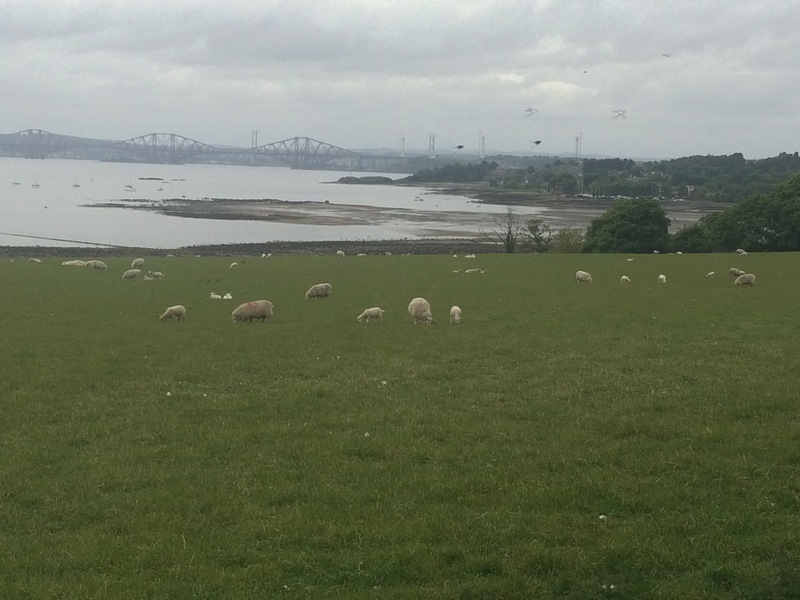 As I cycled out of Dalmeny Park suddenly it was there, right in front of me, the Forth rail bridge. What a magnificent sight. 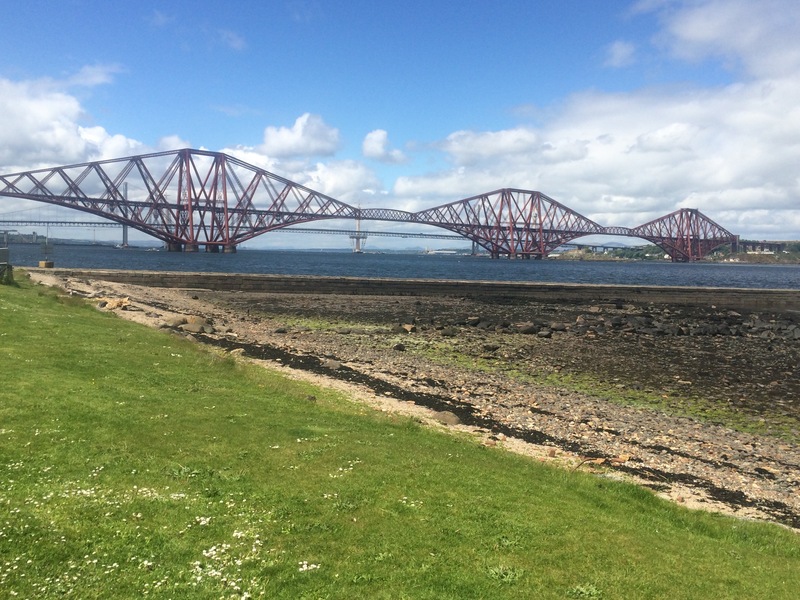 I stopped in South Queensferry to admire the view. This little town maintains a cobbled street and some quaint, old shops and taverns, and it is the disembarkation point for people arriving on huge liners to visit Edinburgh. Fortunately none were docked in the Forth today and it was rather quiet. The cycle over the bridge was great as the views were amazing. I can’t believe I didn’t know a 2nd road bridge is being built; a sign I’m from the South I suppose. 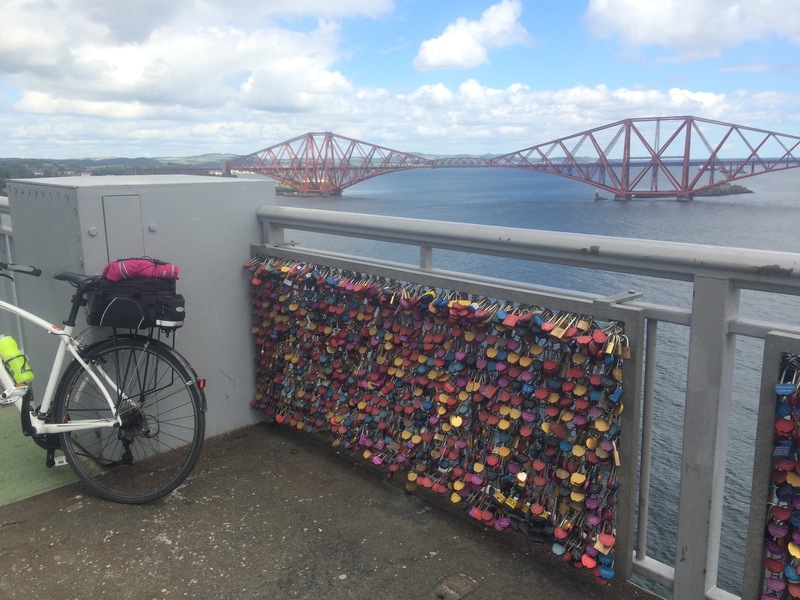 It’s not just Paris that has padlocks on bridges! 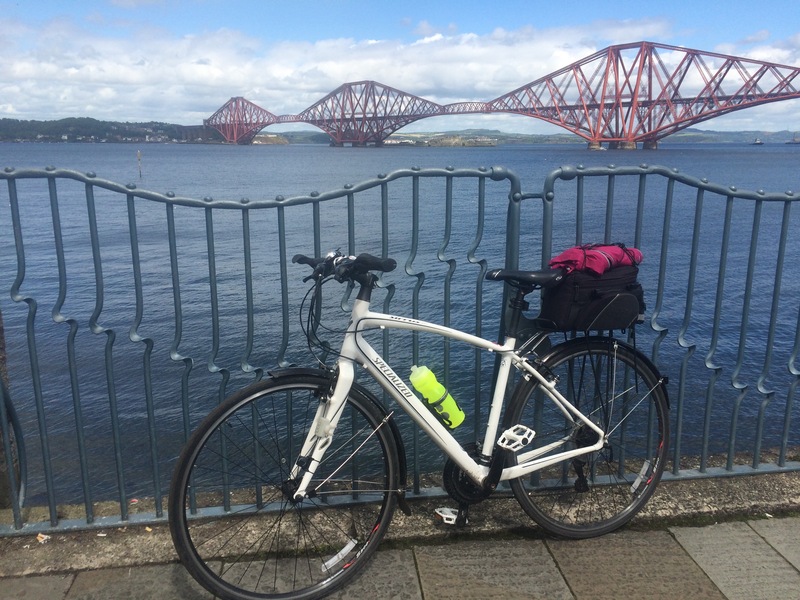 Once off the bridge I cycled up the Ferry Hills overlooking a large quarry and then down a very steep hill into North Queensferry. I admired the old pier and the light tower that enabled the boats that provided the Queensferry passage in the 1800s, before the rail bridge was built in 1890. It was time to head back across the bridge and I was lucky that the number 1 cycle route goes from the Forth Road Bridge, through Edinburgh city centre, all the way to Dalkeith. (Actually it goes from Dover to Shetland.) Brilliant. I followed it all the way back and only got lost once when the signs disappeared as I exited Meadow Park near the university. What a bonus; all the city sights as well as the coast path. What a great day. I was tired and had a sore backside by the end though! It was raining and high winds were forecast. 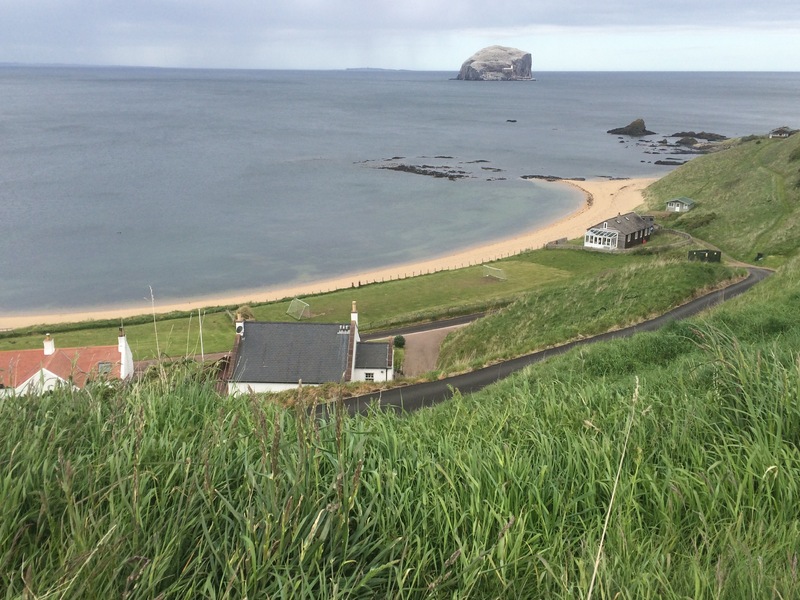 I hadn’t had time to look around North Berwick yesterday and I wanted to visit the Seabird Centre there and get a boat trip to Bass Rock to see all the birds. It didn’t take long to come to the conclusion that I would get more from my day if I just did some sightseeing. 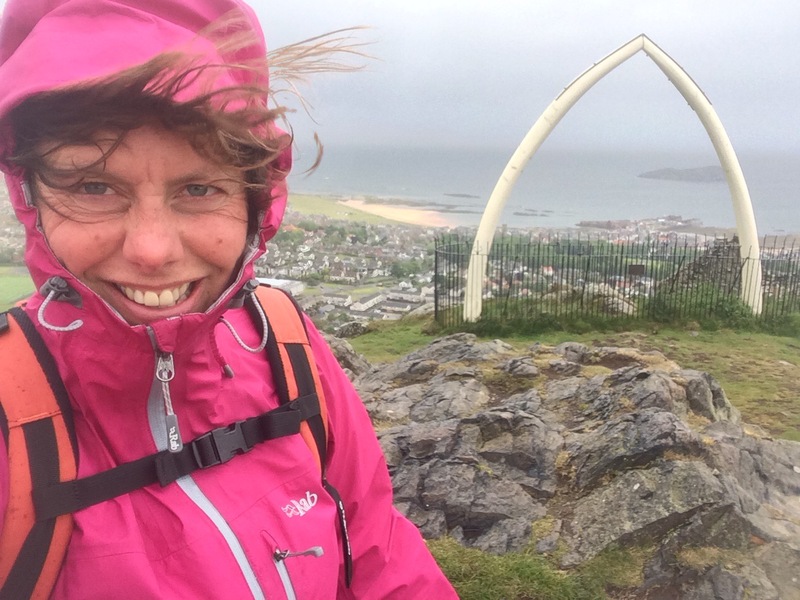 Ali gave me a lift to North Berwick (so no meeting people on the bus today) and dropped me at the bottom of the North Berwick Law, which is a random 187m conical hill just at the back of North Berwick. It was once a volcanic plug and is not the only random mound in the area (Arthur’s Seat in the centre of Edinburgh is another). I thought I would brave the rain and wind and climb it (very sensible!) first thing to earn myself a coffee before the Seabird Centre opened at 10am. I earned my coffee. The Seabird Centre is excellent. I headed straight for the ‘birdcams’ that give live pictures from 4 of the islands just offshore: Bass Rock, Craigleith, Fidra and the Isle of May. I watched a Peregrine Falcon devouring a kill on Craigleith and then spent a couple of hours watching gannets, puffins, razorbills, kittiwakes and various gulls, and their chicks. The staff are very knowledgeable and there was also a fish tank with lots of rock pool creatures in it and feeding time was funny. I’m not sure any boat trips were happening in the extreme wind (50 mph) but I’d decided it was too cold anyway. After a lovely morning I wandered through the town trying to decide which cafe to get lunch in. A quaint little town with a whiff of money about it. 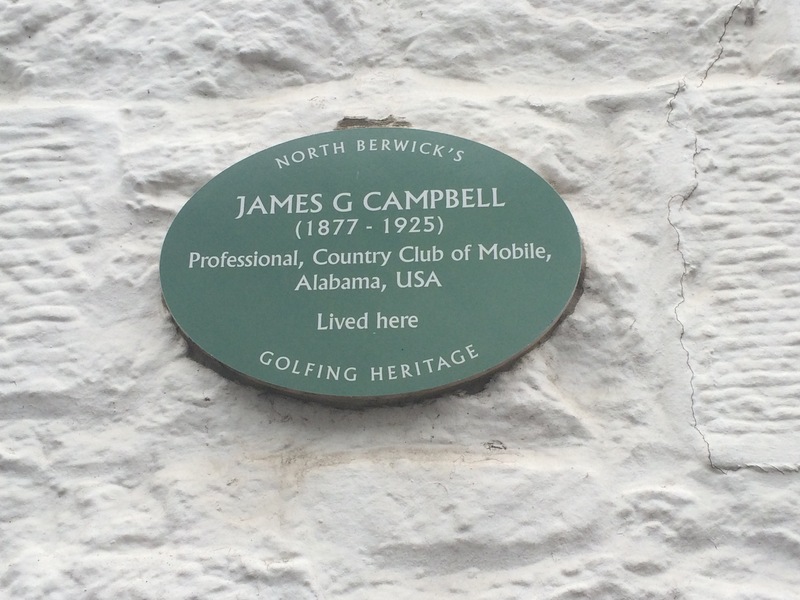 I was bemused to see blue plaques on some of the walls relating to golf professionals! After lunch the sun was coming out so I thought I’d walk to Gullane to join the dots of this part of the coastline. 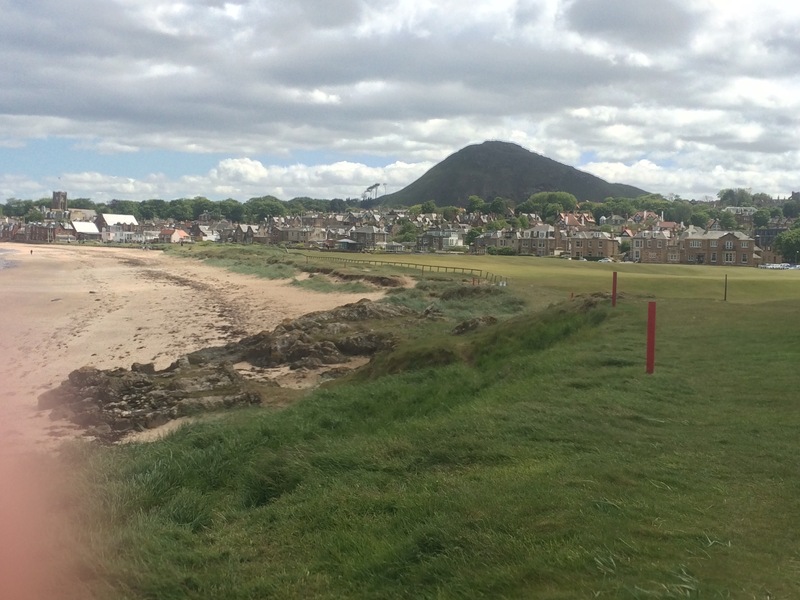 I started by walking out of town along the edge of North Berwick golf course, which was very busy and every player was accompanied by a caddy wearing a special caddy-bib. Very posh! As yesterday, my route was a mix of beach walking and fighting my way through the dunes. I struggled to find the marked path on occasions. I walked past Muirfield golf course but I was well out of the way in the dunes. Ali kindly picked me up from Gullane and then we drove along the coast roads to Musselburgh: around Aberlady Bay and through the old mining towns of Cockenzie and Preston Pans. We passed Port Seton caravan park; a popular holiday destination for some Edinburghers. I don’t feel the need to go back and walk this section. As it was Ali’s birthday we went out for a lovely Italian meal to celebrate. I left early to catch the 2 buses I needed to get to Dunbar. I decided there was no need to head back to Cockburnspath and walk around Torness Power Station so I’d start at Dunbar. I met Andrew on the bus, or rather he decided he wanted to meet me. Just like when I caught the bus to school as a child, I seem to have retained the attractivity I had then for some of the world’s slightly stranger folk. The conversation was slightly one sided as I struggled to understand his accent and had to maintain breathing through my mouth in order not to faint. I was alarmed at one point that he might want to walk with me for the day but fortunately not. Bless him. 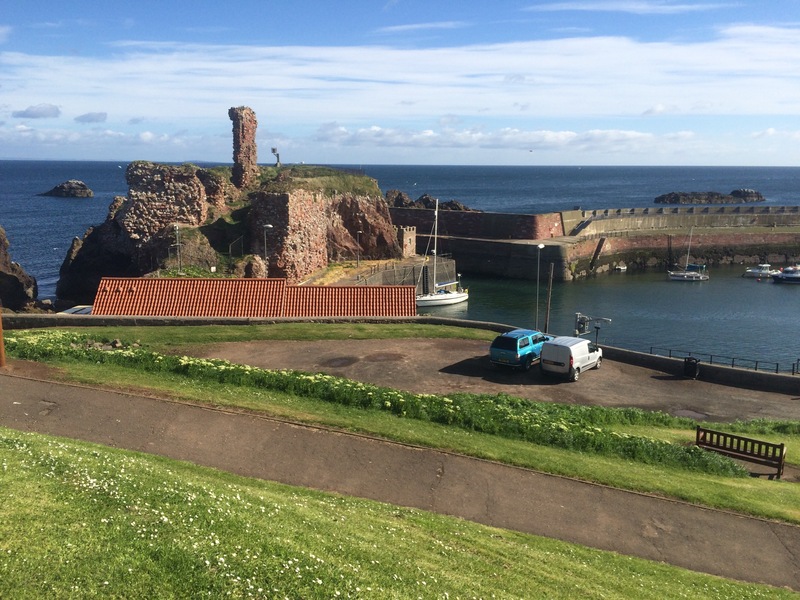 Dunbar gives the impression of a nice little seaside town with the ruins of a castle on the headland and the obligatory golf course. This section of coast is full of links golf courses and North Berwick seems to be the centre for the grey golfing pound in East Lothian as there are courses everywhere. 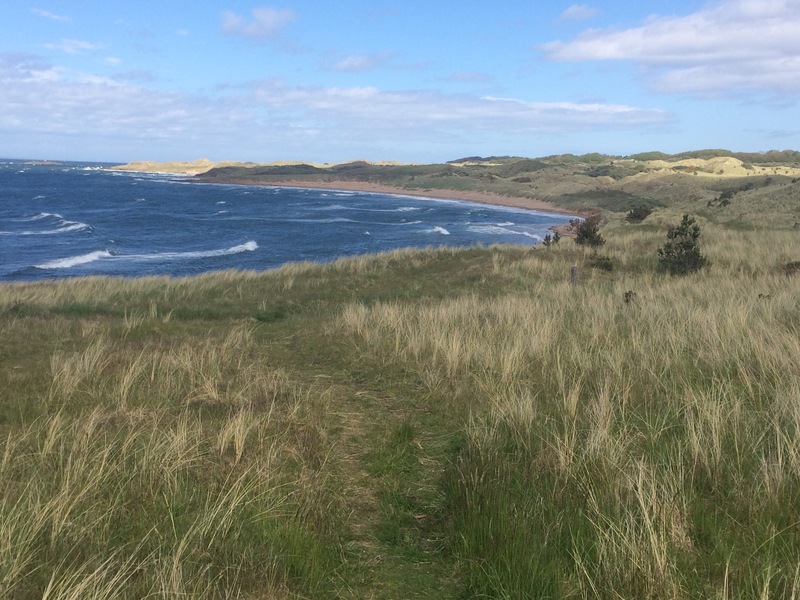 Dunbar was the home of John Muir, the founder of the National Park movement (albeit in America!) and he is widely celebrated. 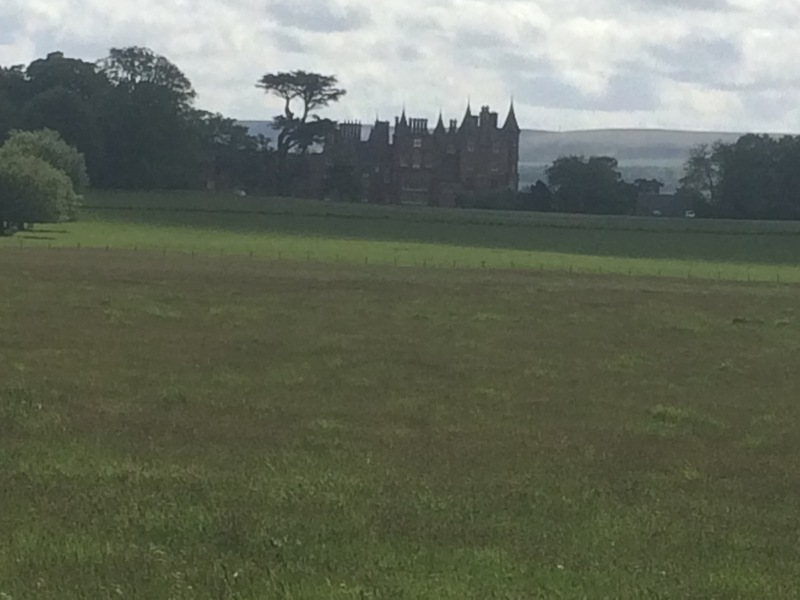 I started today’s walk along the John Muir Way, until Tyninghame where it heads further inland. Tyninghame itself is slightly inland but is on the road with the only public bridge across the River Tyne. 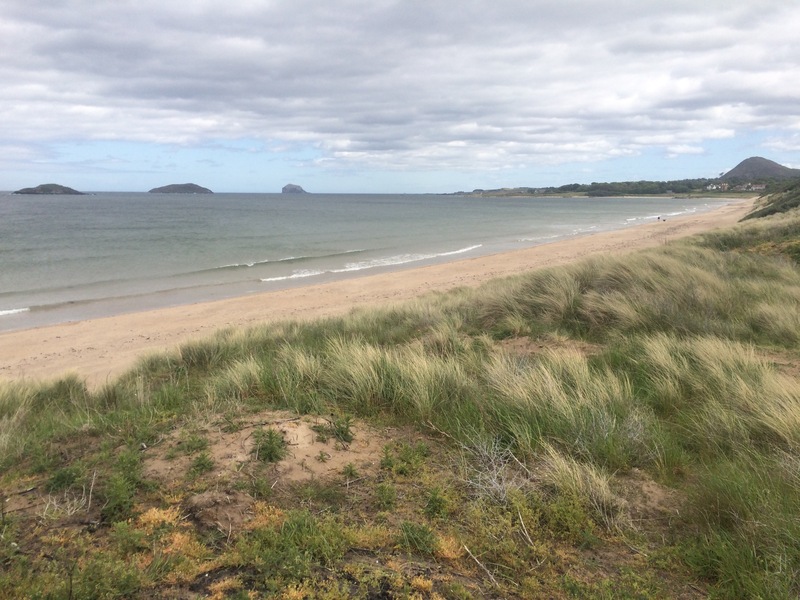 This requires a trek around Belhaven Bay but it does give a good view of the fertile farmlands of East Lothian, known as “the breadbasket for Scotland”. I had tried to take a footpath through the Tyninghame House estate but after 25 minutes of walking I reached a private bridge over the River Tyne and it had a padlocked gate, so my plan to cut a corner and avoid a busy A-road was thwarted. The field behind the gate contained a herd of Limousin Cattle, including an enormous bull, so conceding defeat was probably for the best. My presence must have been unusual for the wildlife and I disturbed 9 herons who were all fishing from the same riverbank. The weather had been generally fine, some sunshine and very windy. Every so often a 2 minute shower would appear from nowhere and I’d still be wearing my sunglasses, as the sun was still shining, while getting rained on. Very strange. Due to my fruitless diversion I arrived at Tyninghame village coffee shop in time for a spot of early lunch so it worked out well. After that the route got trickier as the coastal path seemed to disappear on me. 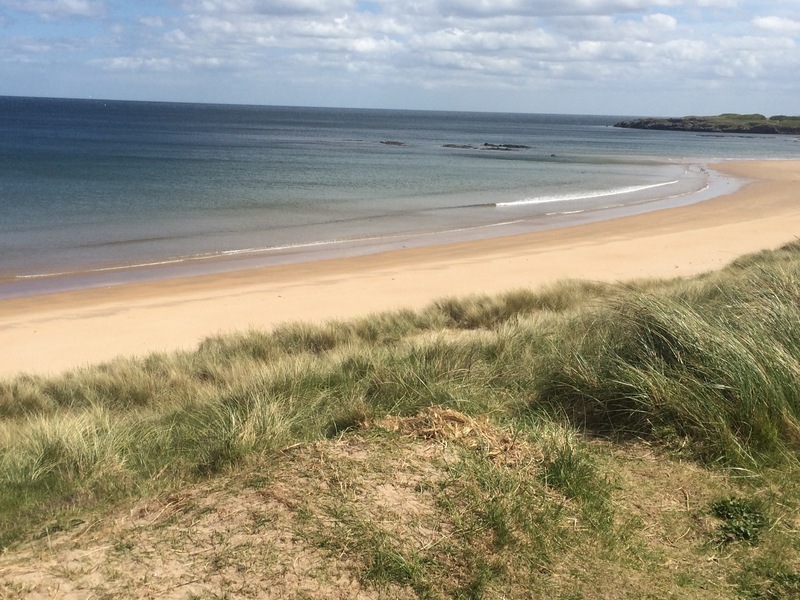 I headed onto Ravensheugh Sands and it was completely deserted. The dunes made a sort of cliff so the beach was only accessible at a few points. There were rocks under the water and lots of eider ducks paddling around and grazing, as well as gulls, plovers and oyster catchers. The tide was quite high by the time I was dancing over Scoughall Rocks and eventually I was forced off the beach near the headland. 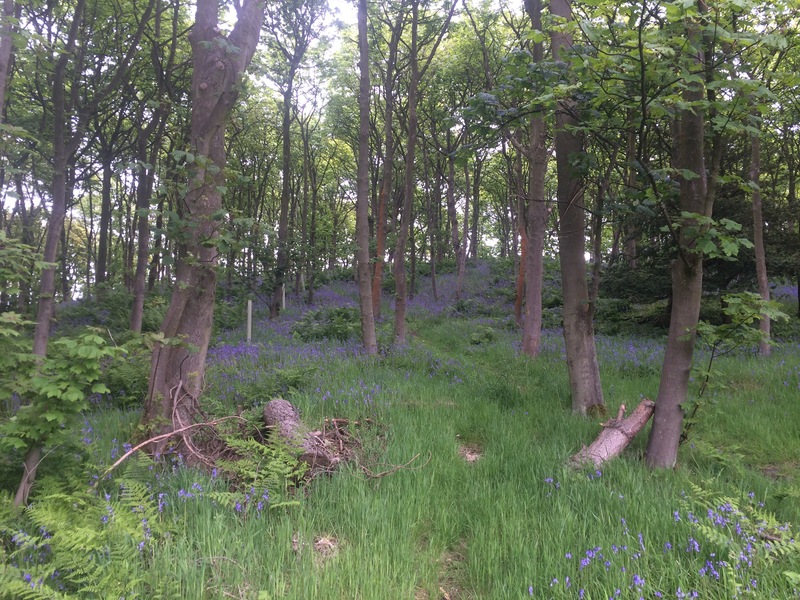 Scoughall Rocks – good for scampering over like a child! 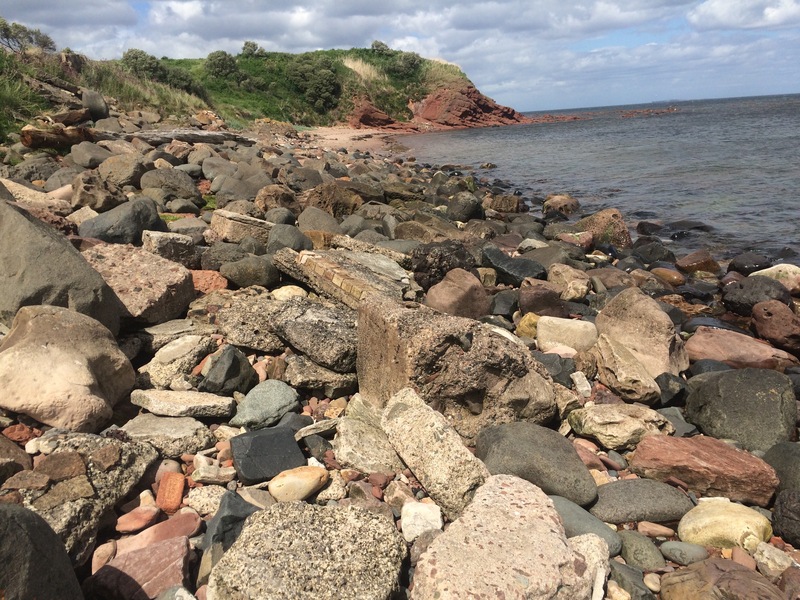 Although there was a sign in Dunbar claiming a coastal path existed, I can verify, it doesn’t. Once off the beach I had to battle my way around a wheat field, climb over a wall and walk through private land before I reached Seacliff hamlet. From here it is possible to drop down a dirt track to a lovely beach, which I presume is pretty quiet. I had to walk a mile on the A198 and the sky was darkening and threatening rain. 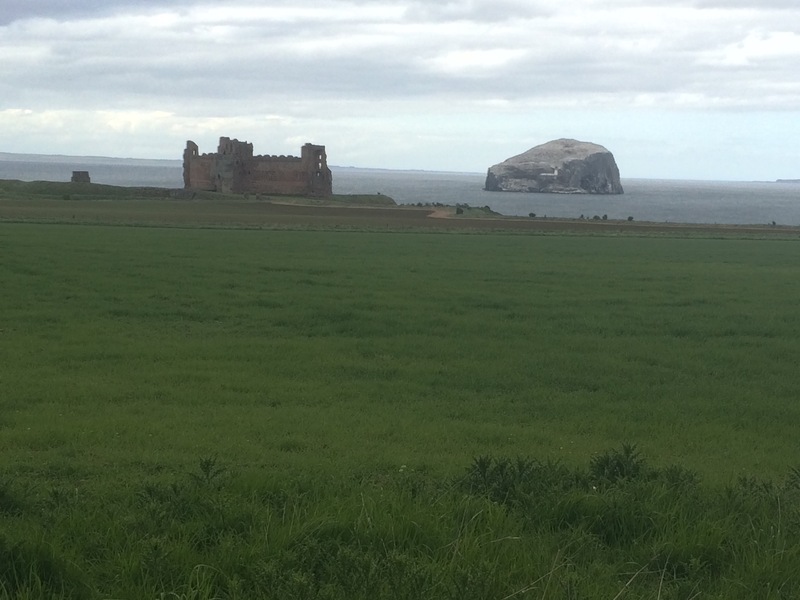 I looked across the field at Tantallon Castle but didn’t make the detour to reach it as there were no paths on the map and I’d had enough of fighting my way through path-less land. Well what do you know, as soon as I left the road where it overlooks the beautiful Canty Bay, I was fighting my way through long grass and nettles again with no sign of a path. Finally I reached the Glen Golf Course overlooking North Berwick from the East and could drop down into the town to catch the 2 buses back to Ali’s. Fortunately it didn’t start raining until I was on the bus.